Ahoy! These brilliant macaws are so real, they look as if they could almost fly out and land on your shoulder. 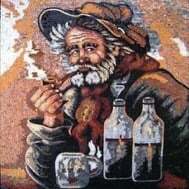 PROs: Handmade mosaic wall art composed of high-end glass tiles that is guaranteed to elevate your space. Mosaicist: Haith D.
CONs: They may not lead you to any pirate loot, but at least you get to enjoy their brilliant plumage.